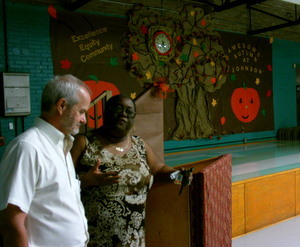 Stung by the pain of a broken promise, members of the James Weldon Johnson Elementary School community did their utmost Wednesday night to convince the new chief of the Recovery School District to resurrect a plan to move their campus to a safer, more prestigious site a few blocks away. 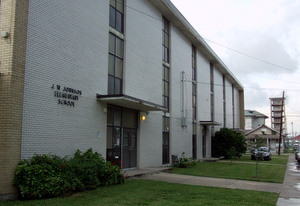 The Priestley site on Leonidas would symbolize social change, many said — traditionally, white schools in New Orleans were built on major thoroughfares like Leonidas, while black schools were tucked behind them in the neighborhood, like Johnson. But more importantly, the Priestley site is in a safer part of the neighborhood, they said. The original post-Katrina master plan for rebuilding New Orleans schools did not even include a mention of Priestley, recalled Jerry Speir, a Carrollton resident who has been helping Johnson in its efforts to apply for a charter. After public outcry, the plan was revised, and Priestley was included as a renovation project once money became available. After FEMA designated $2 billion to rebuild New Orleans schools last year, however, another plan was released — again with Johnson slated for renovations at its present site, and Priestley left out. “What’s frustrating to me is, this piece we’re doing now, we had gone through with RSD last year,” Brooks said. After opening the meeting by stating his intent merely to listen, Recovery School District superintendent John White offered neither promises nor rebuttals to the statements made by the speakers in the audience of more than 50 Johnson teachers, parents and neighbors. Over the next few weeks, district officials are finalizing the revised plan for the FEMA money, and the question of whether to renovate Johnson or move to a new school at Priestley is being studied, he said. Part of the concern is that using the Priestley site will be far more expensive than renovating Johnson, because it is much older. It could be riddled with termites or asbestos, making even demolition more expensive, White said. 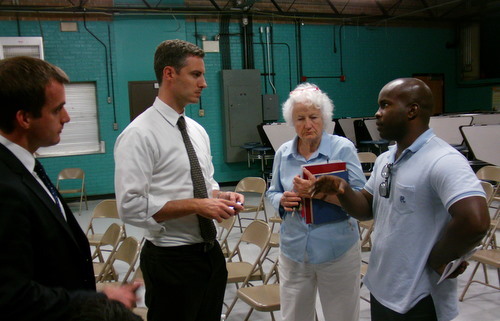 White was challenged on that point by Tilman Hardy, president of the Pensiontown Neighborhood Association. The school district should do the studies to determine the cost, so the conversation can be factual, rather than hypothetical, Hardy said. 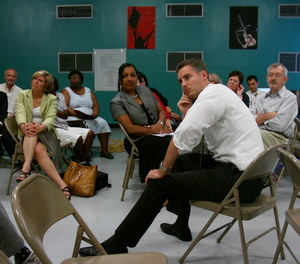 White agreed, and asked Hardy what his preference would be if the costs come out roughly equal. Under Brooks’ leadership since Hurricane Katrina, Johnson’s performance scores have increased from lows in the 20s — far beneath failing — to their present level of 67, rising for the first time this year out of “academically unacceptable” status. One of the school’s challenges, however, is losing the students they put on the right track to more desirable schools, because of the dangers both real and perceived around the Johnson campus, faculty members said. A more prestigious campus and location would make those gains easier to retain. To read our live coverage of Wednesday’s meeting, click “Replay” in the box below.